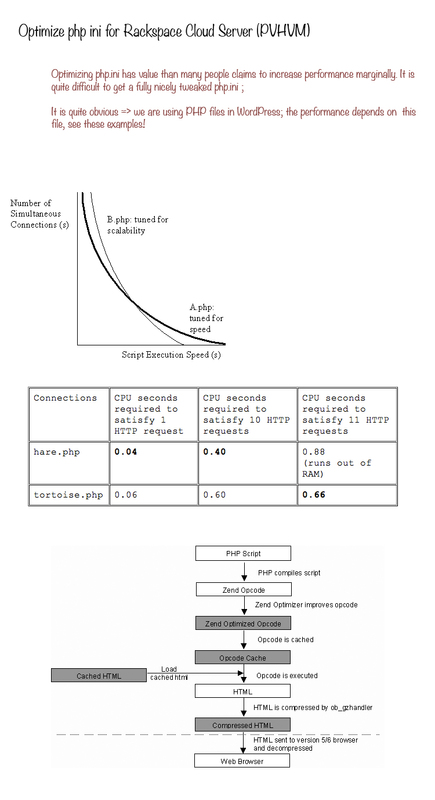 Here is a quick guide to optimize php ini for Rackspace Cloud Server (PVHVM) for higher performance and lower page loading speed. We talked about PVHVM Virtualization Mode. You probably know about guides on APC Configuration and Optimization for Rackspace Cloud Server (PVHVM), Rackspace Cloud Database, Install APC, Tweak MySQL my.cnf, use Varnish Cache etc. Also, you can read Memcached Configuration and Optimization for Rackspace Cloud Server. Also, it is suggested to read Hardening Rackspace Cloud Server for WordPress. Last but the most important remaining is Optimize php ini for Rackspace Cloud Server (PVHVM). It simply means your configuration is not read. A syntax error in php.ini in line numbered x, will render next all the syntax not excite. Do not edit on FTP client like Filezilla in all cases, it is a handy tip for testing settings for huge changes. and load the file on browser, you will get all the information. Also, if you want a crazy nice script, you can download it from this article to get maximum possible information about php. We actually did that part on previous guides! At any time, you can test instantly your tweak by calling the functions. This Article Has Been Shared 2165 Times! Cite this article as: Abhishek Ghosh, "Optimize php ini for Rackspace Cloud Server (PVHVM)," in The Customize Windows, May 2, 2014, April 20, 2019, https://thecustomizewindows.com/2014/05/optimize-php-ini-for-rackspace-cloud-server-pvhvm/.